Nearly 40% of the Americans read printed books exclusively and only 6% of the US people are digital-only book readers. No matter how quality your device screen is it can’t replace the original book reading experience. Famous motivational speaker Simon Sinek has added a special scent to his book “Together is Better”. The scent can be felt only with a hard copy, not in the digital form. If you are designing some interesting head-turning design for your book, these book mockups will help you present your design elegantly to the users. A small survey was conducted to know what makes a reader attracts first towards a book. The first thing that attracts a reader is the genre and the second is the author. So make sure the book cover you design, clearly depicts the genre of your book. There are several types of book covers like hardcover, softcover, and paperback. Based on the shape of the book also the design is classified as square book covers and landscape book covers. In this list of book cover mockups, we have collected all the famous book cover categories. With these mockups, you can give a clear idea of your design to the audience. 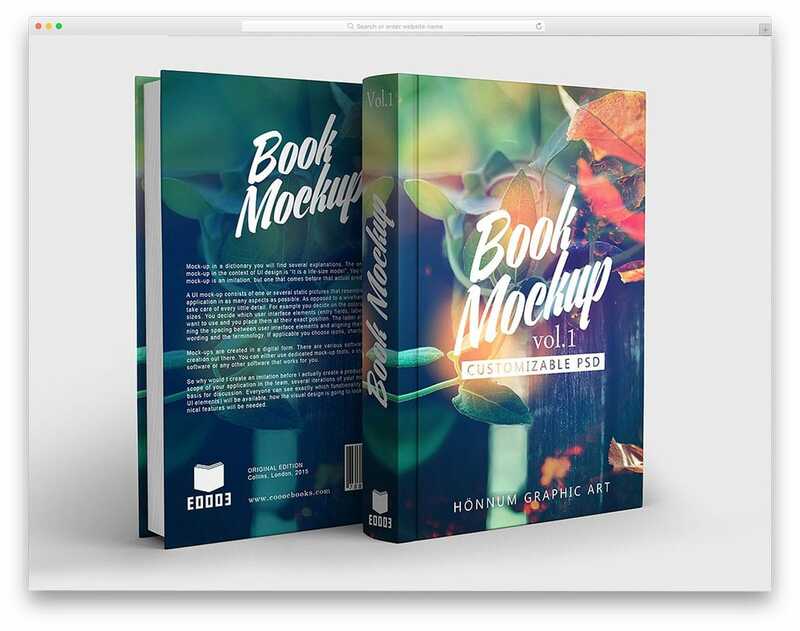 Book Mockup Vol 1 is the best mockup for book cover design presentation. This mockup includes the book cover, back cover, spine or endpaper of the book. So you can clearly so your entire design to the user or the publisher. You also have an image with multiple books, which you can use to show your design variations in one place. The shadows of the images are given as separate PSD layers so you can customize them easily. Minimal light color backgrounds are used by default, but you can customize it to the color or the pattern you want. As this mockup uses high-quality images, you can zoom in and clearly show the detailing of your design. If you are designing softcover for your book, this would be your one-stop destination for your design presentation. The designer of this mockup has included images of the book shown in different angles and in different positions. 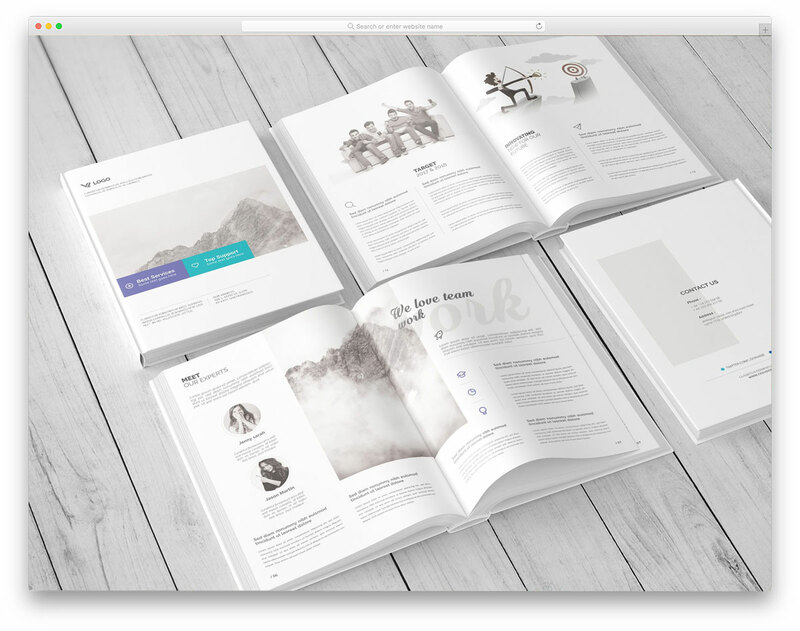 If you are also designing the inner pages of the book, there are open book images to show your design; just like in the magazine mockups. You get both a clean background and textured background options with this mockup package. But still, you can add your own custom background if you want. The mockup also has a human holding book image to give a clear idea of how the book looks on people hands. As the name implies this mockup has square sized book mockups. Many how-to books and skill development oriented books follow this size. Because in the same page itself you get enough space for the image and the related contents. The readers can easily read and understand the content by correlating with the images. 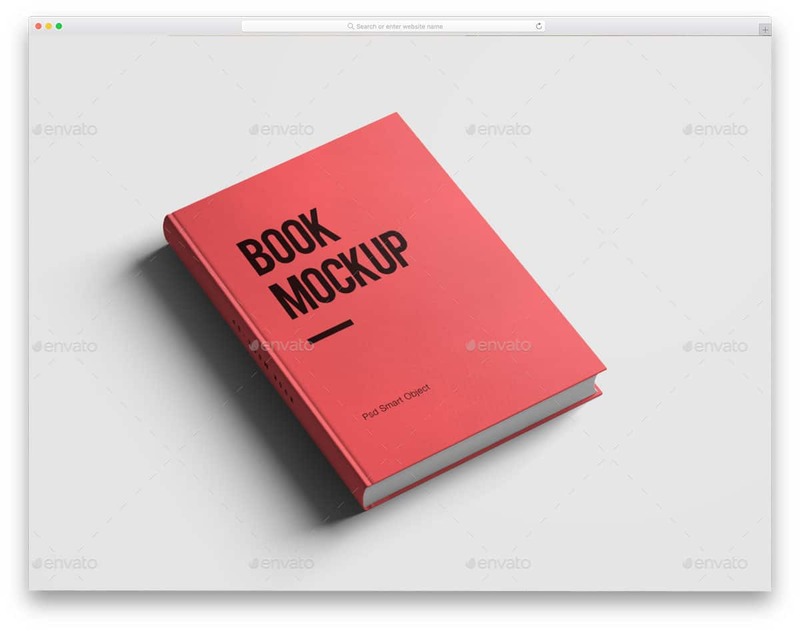 If you are designing one such book, this mockup will come in handy for you. This book mockup includes a sturdy hardcover with clear foldings at the edges. Since this mockup uses high-resolution images, you can clearly show your design on the nook and corner of the book. 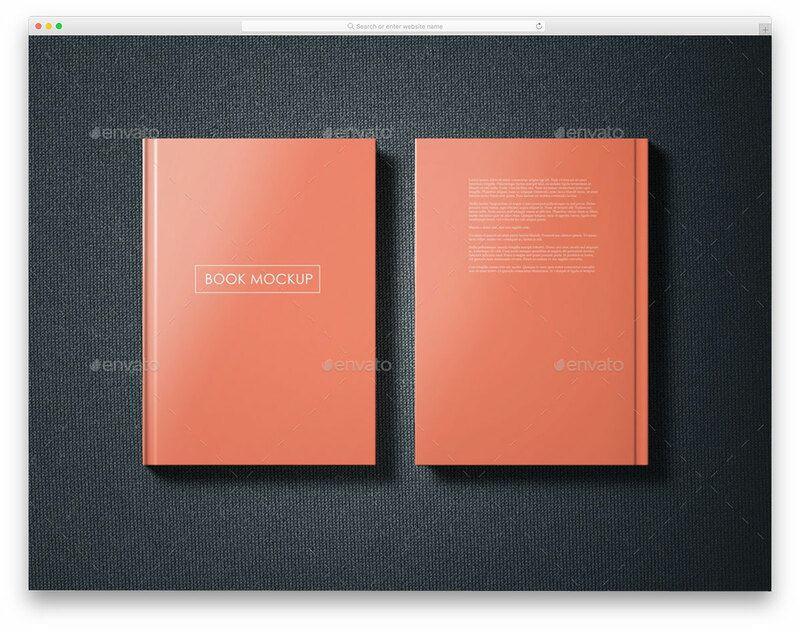 With this mockup also you get open book type image. The reflections and shadows can be easily handled in this mockup because they are treated as a separate layer. These type of books are mostly used for children books and photography related books or other such image-rich books. If your book contains lots of big images with texts, books with landscape design will be a perfect choice. This mockup is also from the creator of the Square book mockups mentioned above. You get the same type of images as in the square book mockup mentioned above. The customization options are also designer-friendly and you can customize almost all the elements in the mockup. 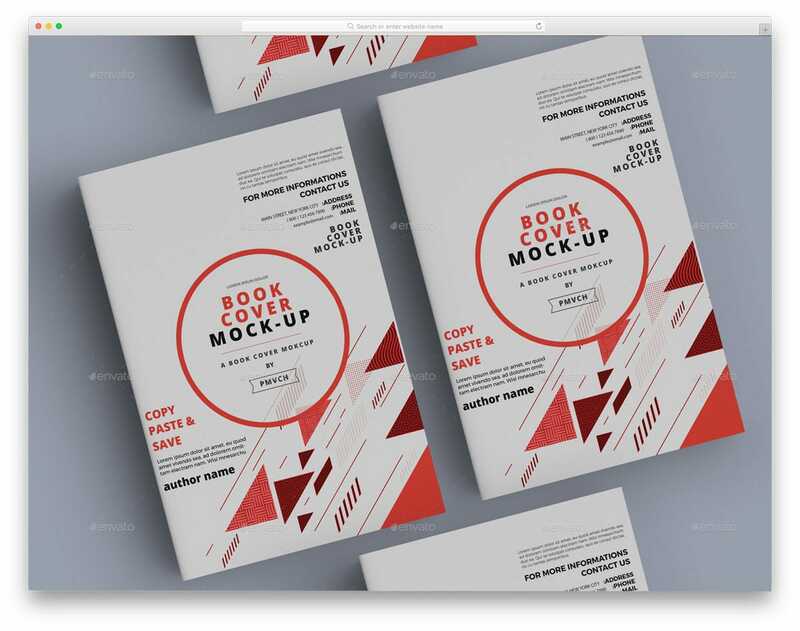 Multiple book images are also included in the mockup; if you are giving more than one design options, these images will help the users to easily compare your designs and pick one. This Book mockup is another hardcover book mockup. Since the images are taken in perfect lighting conditions it gives a clear view of the book. By default, you get a minimal background in the mockup set to elegantly highlight your design. But you can add your own design to make a unique scenery for your book design presentation. In the mockup set itself, you get well zoomed in images to show your design details clearly to the audience. Along with the book mockups, you also get six pre-made high-quality background textures. The creator of this mockup gives you full freedom to customize the depth of field and shadows to give a realistic view to your design. Though the printed books are familiar than the digital books, some people prefer to get a copy in all the format for easy accessibility. Some publisher with a membership model gives their user to access the contents in both hard copy and digital copy. If you are designing a book for such a client, this mockup will come in handy for you. 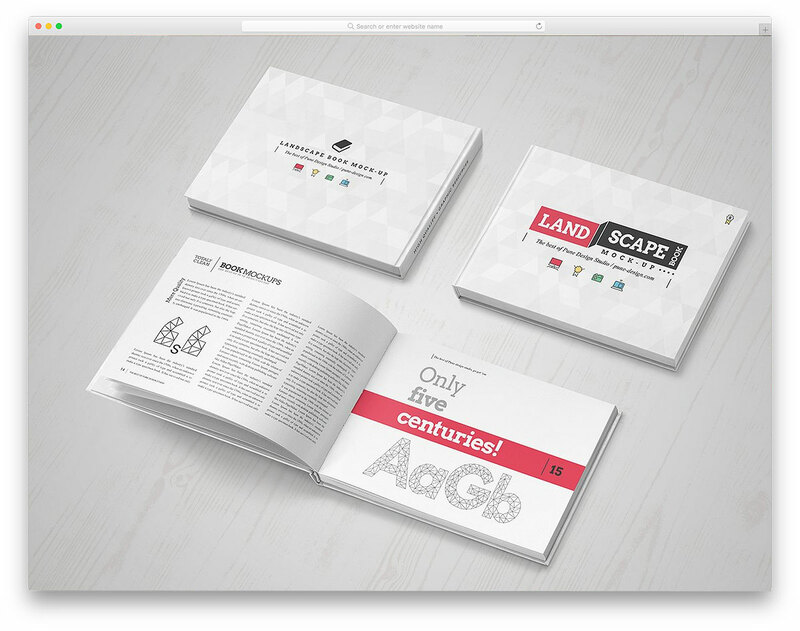 With this mockup, you get both hardcopy book models and an iPad mockup to show your digital copy of the design. Isolated book images and book bundle images are given in the mockup to give a clear idea of the book design in the real world. If your book has different volumes these book bundle image will come in handy for you. Dust Jackets are normally used to add a promotional information of the book. 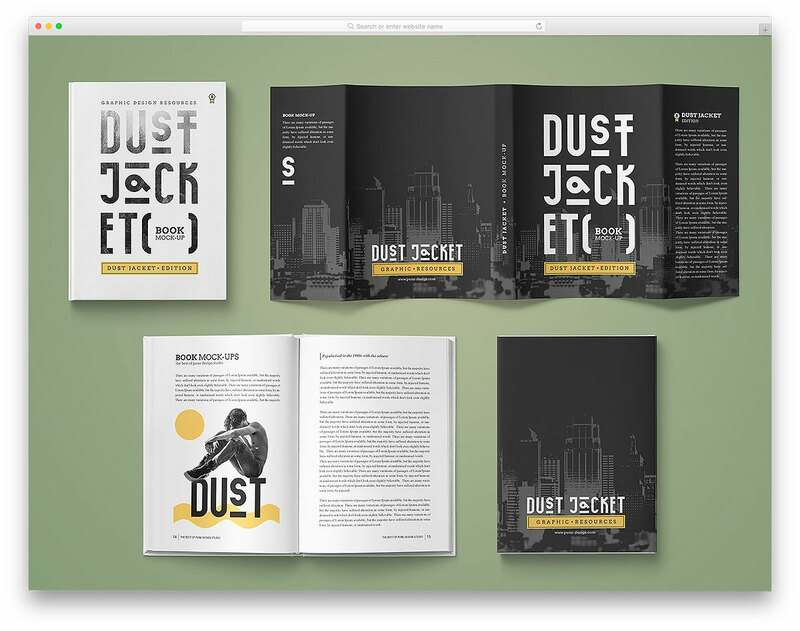 The dust jackets usually have lots of space for the text contents to give information about the author, awards, and appreciation given for the book. This approach is usually followed for best selling authors and the books that did well in the first set. If your clients have a special requirement like this, the Dust Jacket book mockup is the perfect option for you. 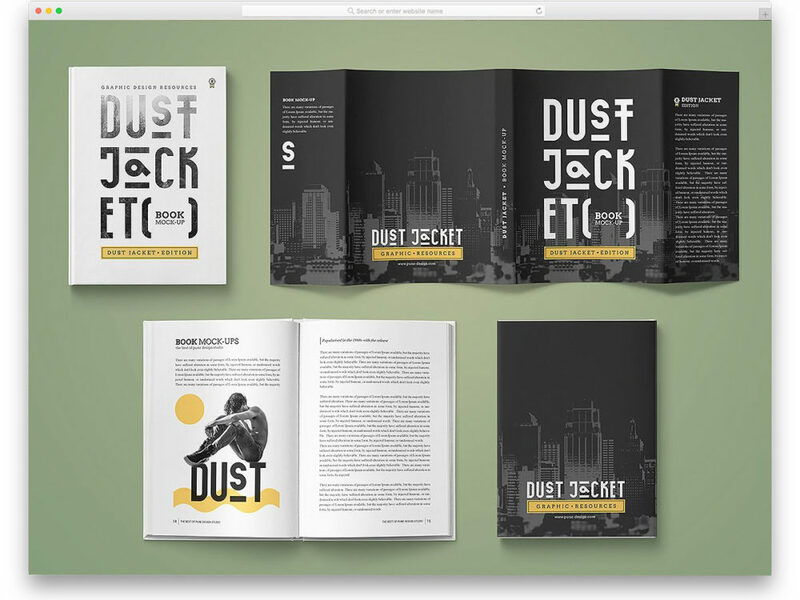 The designer of this mockup gives you images for both the dust jacket and the book cover. So the user can clearly see the difference in the design. 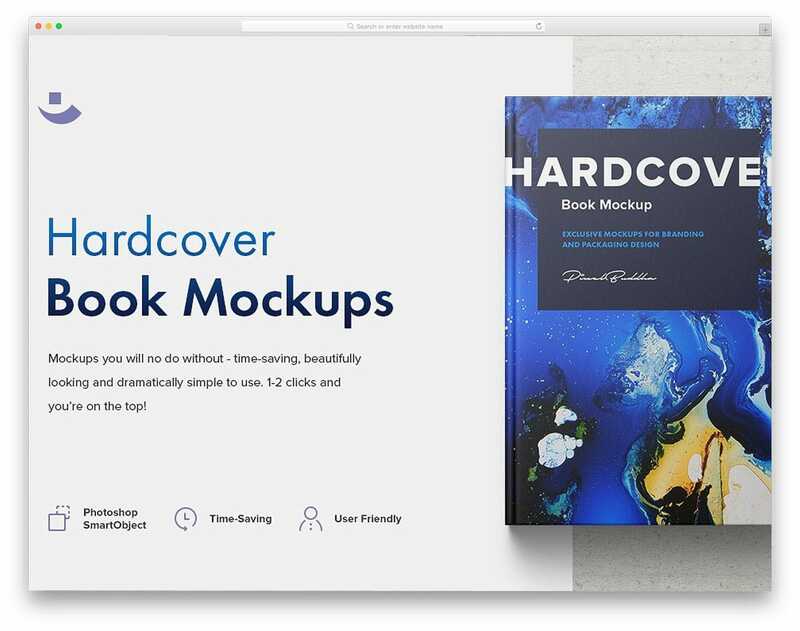 Just like in all the other book mockups in this list, this one also allows you to customize the background and the shadows. 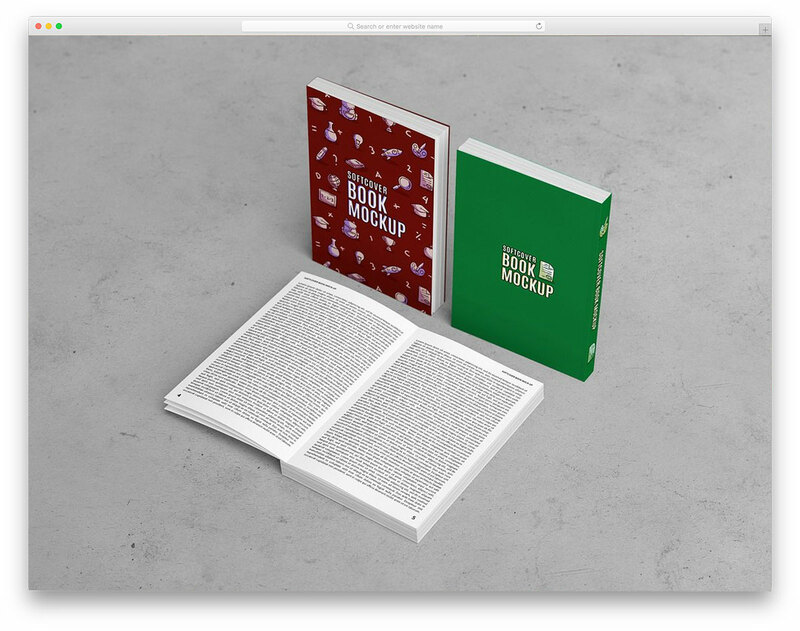 Hardcover Book Mockup Set, as the name implies this mockup has the hardcover book. This mockup includes four different views and six textured backgrounds. Comparatively this mockup has fewer mockups than the previous one, but it is more affordable. For this price, you have to accept a little trade-off. Other than that this mockup is a perfect option for professional use. The creator of the mockup hasn’t restricted the customization part. All the basic customizations like background editing and adjusting shadows are included in this mockup. Overall, this mockup is perfect for showcasing your design in the portfolio or for creating website images. It is a simple and elegant looking book cover mockup. As the name implies, this design includes a soft book cover. The flexible nature of the soft book cover is clearly captured in this mockup so that you get realistic images using this mockup. Shadow and depth effects are used smartly to give a real book feel. 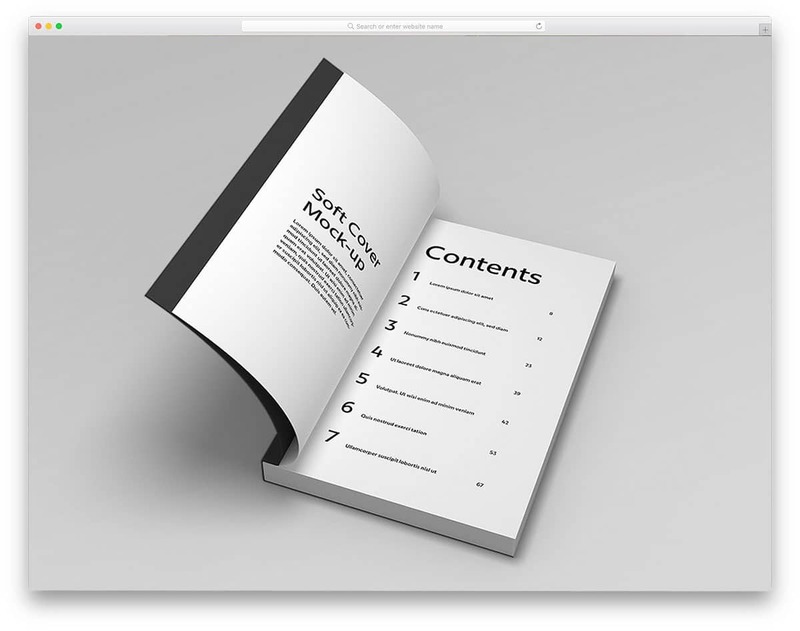 The creator has also given you open book images, if you are using a special font for the book, this image mockup will come in handy for you. 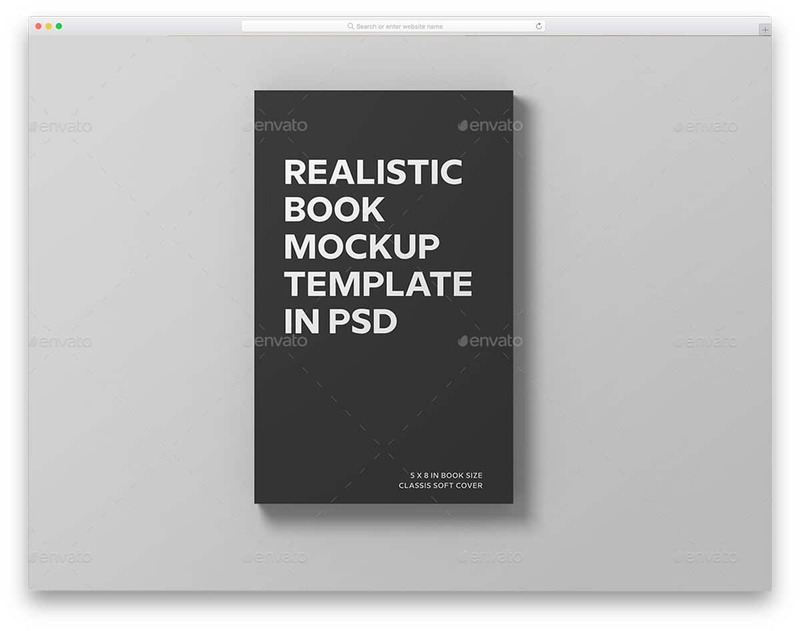 Just like most other book mockups in this list, this one is also a PSD based mockup. Softcover books are more preferable than the hardcover in terms of portability. Many readers who would love to read on travel love to pick softcover books with them. 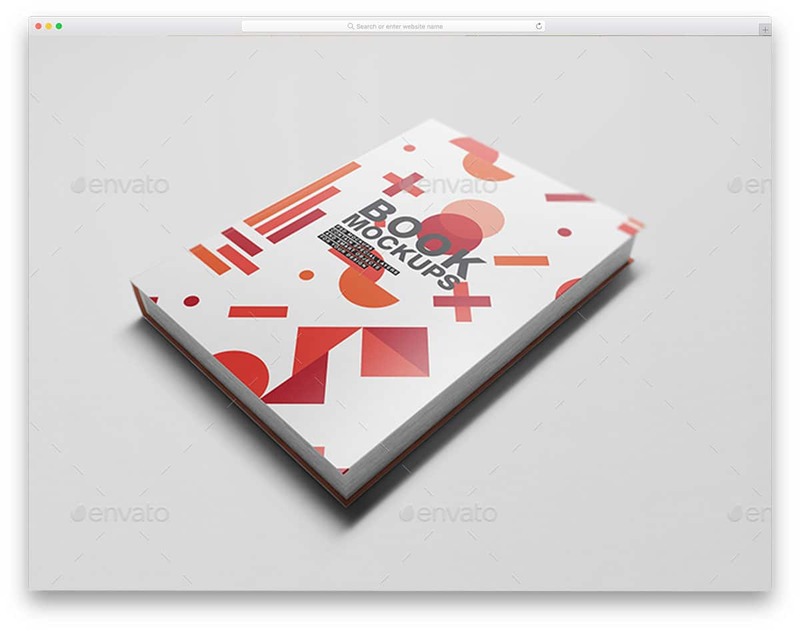 This softcover book mockup gives you eight PSD files and each of them has a different image. The well-organized layers help the user to easily customize the mockup and also adds a natural look to the mockup. Shadows and smart objects are given in a separate layer so that you can customize the mockup without disturbing the other elements in the mockup. Apart from shadows, the designer also gives you the option to customize the depth of field to give a realistic look to your design. 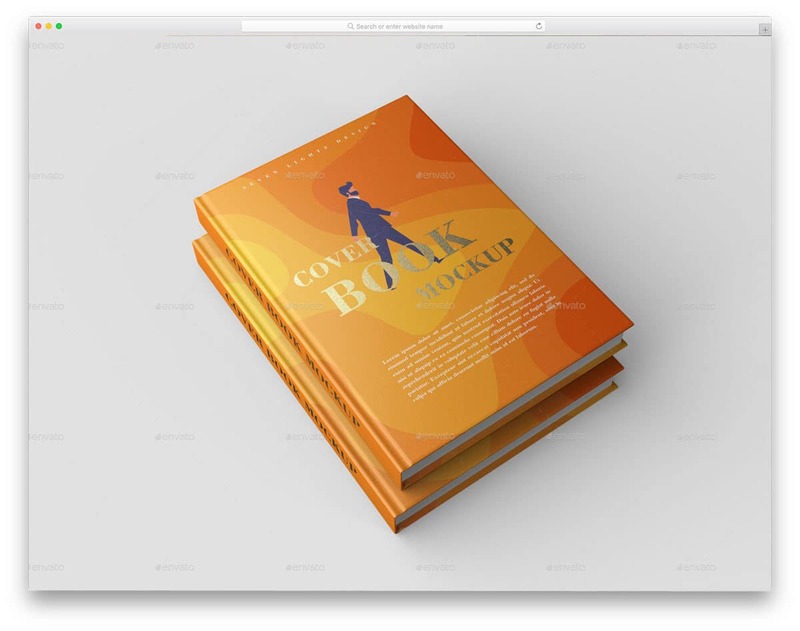 This mockup is the best option for book design presentation. 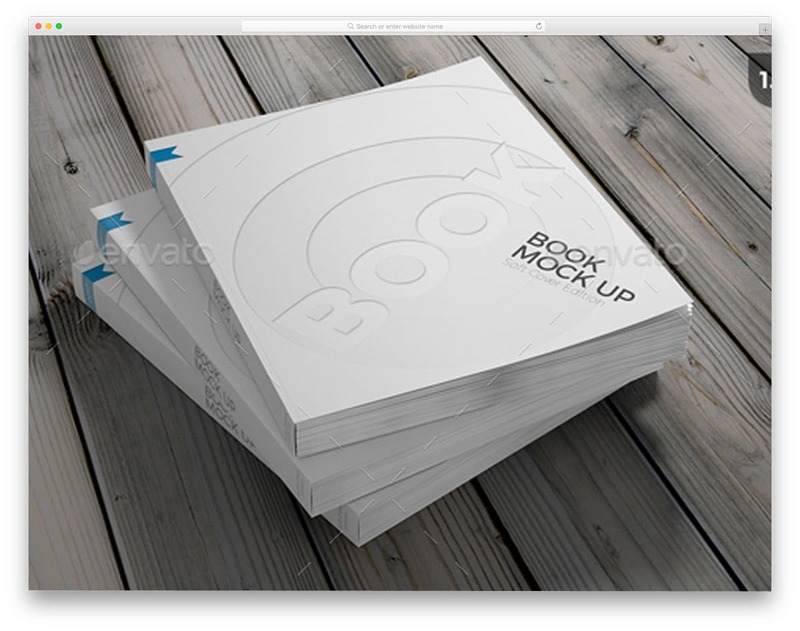 The mockup includes a floating book image, the top view, and the open view, with which you can clearly showcase your design. By default, you get a minimal background in the mockup but there are also other background textures included in the package. PSD layers are handled smartly in this mockup so that the characteristics of the pages and the reflections on them are preserved. In the download file, you get 6 PSD files and all of them have well-organized layers for quick customizations. The book used in the mockup has standard A size so that it can be used for almost all types of books. As the name implies, this mockup has a Square book with the dimension 210x210mm. 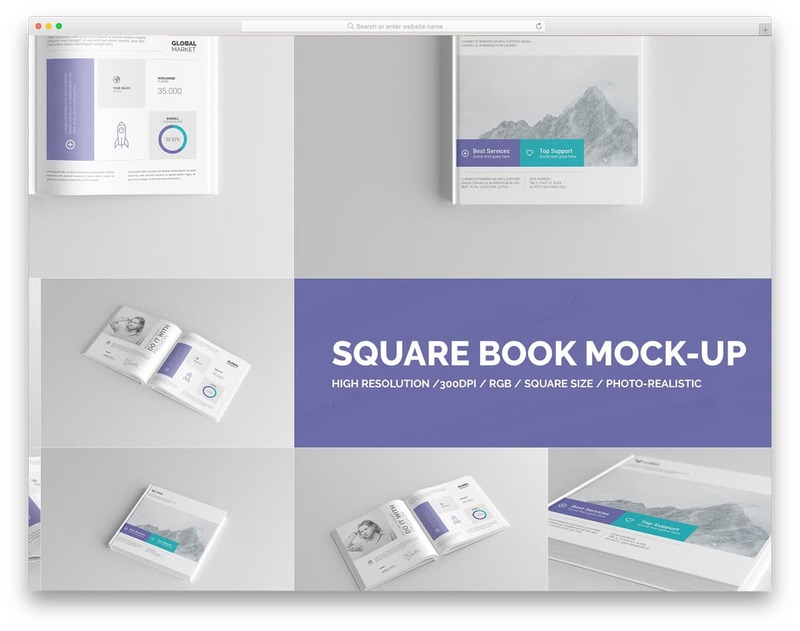 The number of product positions and perspectives is less when compared with the Square book mockup mentioned-above. With this mockup, you get the book front-view, open book images, and one close-up view. Since the images are taken in perfect studio lighting condition you get a clear image in this mockup. The layers are also treated properly so that the reflective nature of the book pages are preserved well. All you have to do is to add your design and present it elegantly to your audience or the clients. If you are looking for a mockup to show the details and the attention in your design, this mockup is the best option. The designer of the mockup has shown the book image in different view and perspective. With this mockup, you can clearly present your design to the audience. Since this mockup has multiple images, you can showcase all your design variations with this mockup itself. Apart from the background color customization and shadow customization, this mockup also gives you pre-made photo filter effects. 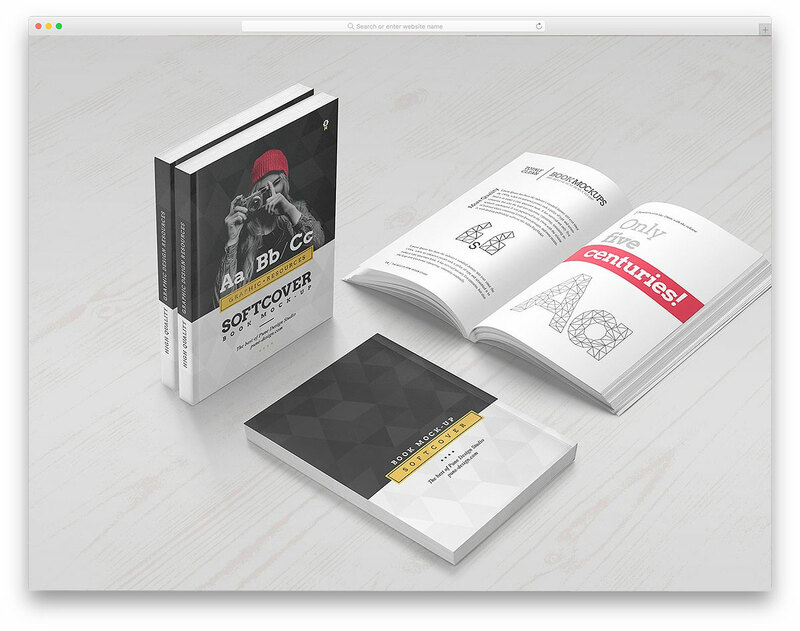 As all the customizations are given to you directly in this mockup, you can create a presentation for your book design in no time. The creator of this mockup has given you seven photorealistic mockup images in this set. 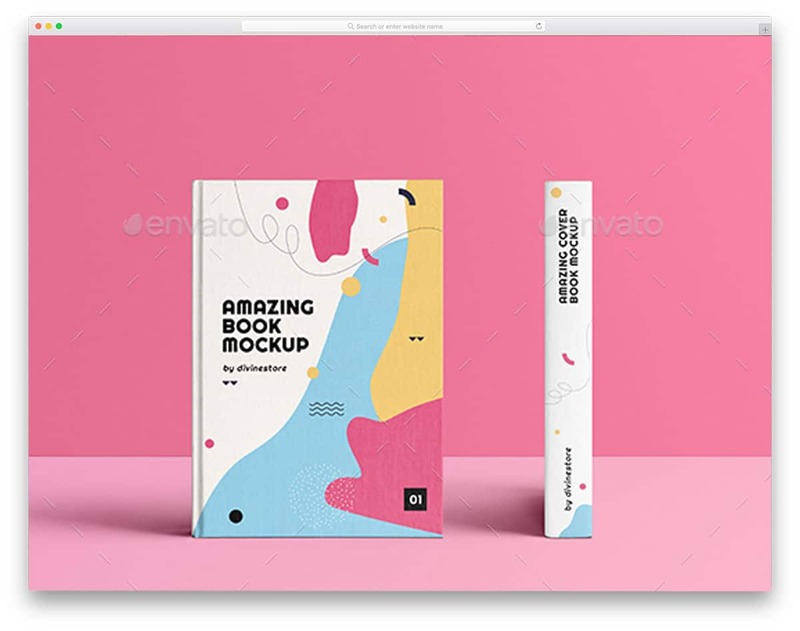 If you are offering more than one design for a book, this mockup will come in handy for you to showcase all your design. Books in this mockup are shown in different perspectives so that you can give a clear idea your design to the users. With this mockup, you also can make a product image for your book in the online store. As users can search and buy a large variety of books online, selling your books online will help you reach more readers. Softcover Book mockup is almost similar to the Cove Book mockup mentioned above, but this mockup is from a different designer. This mockup also has images of the book shown in different angles. The flexible nature of the softcover book is captured well in this mockup. PSD layers are also handled smartly to make your design fit in well with the bends and curves of the image. This mockup doesn’t give you pre-made background textures but gives you the option to add your own custom background. Nine different scenes are given in this mockup and all of them will clearly highlight your book design. The images used in this mockup are in 5K resolution. As a result, you get high clarity image and can your high-quality design file into it and show it to the audience. For optimal result, the creator of the mockup suggests Photoshop version CS2 and above. Since the images are at the highest quality, each and every detail of the book can be seen clearly. More than ten scenes are given in this mockup with which you can show all your design variations. The shadows and the background are treated as a separate layer so that you can easily customize them. This mockup is perfect for all types of design presentation and product image making. Hardcover Square Book Mockups is a realistic image mockup. If you wish to show your book design in a real-world scene, this mockup would be the best choice. Reflective book edges and high-detailing in the image gives a realistic look to the design. In the download file, you get seven photorealistic images and all of them are easy to edit. PSD layers are organized well in this mockup so that you can add your design directly to the file and create your presentation in no time. 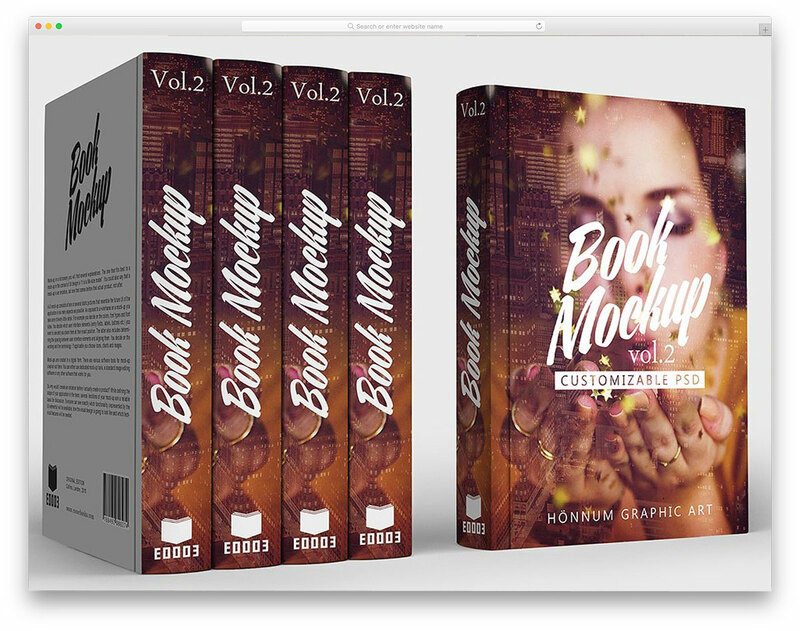 The creator of the mockup gives you the option to customize the shadows and the depth of fields so that you can give a realistic feel to your book design. This book mockup uses a regular size book with a soft cover. The books are shown in different angles and in different positions to help you showcase your design clearly to the audience. This mockup uses images at a 4K resolution so you can even use this mockup for printing and poster creation. The creator of the mockup gives you the option to customize and to adjust the reflections and the shadows. In the download file, you get eight properly layered PSD files. One thing to be noted in this mockup is that you don’t get the background textures shown in the demo. But still, you have the option to add your own textures or background image. This book mockup includes ultra-realistic images of the book. You can not only show your book cover design but also the page layouts. The textures and the look of the paper are preserved well in the PSD layers to give a realistic look to the image. Unlike the above-mentioned mockup, this one includes the background textures used in the demo. In the down file, you get nine PSD files and the background textures. The designer also shared the cover size 15×21cm and the page size 14.5×20.5cm so that you can get an idea before using the mockup for your book design presentation. This book mockup also includes a dust cover book mockup. But this one doesn’t clearly show the dust jacket and the book cover separately as you have seen in the dust jacket book mockup mentioned above. 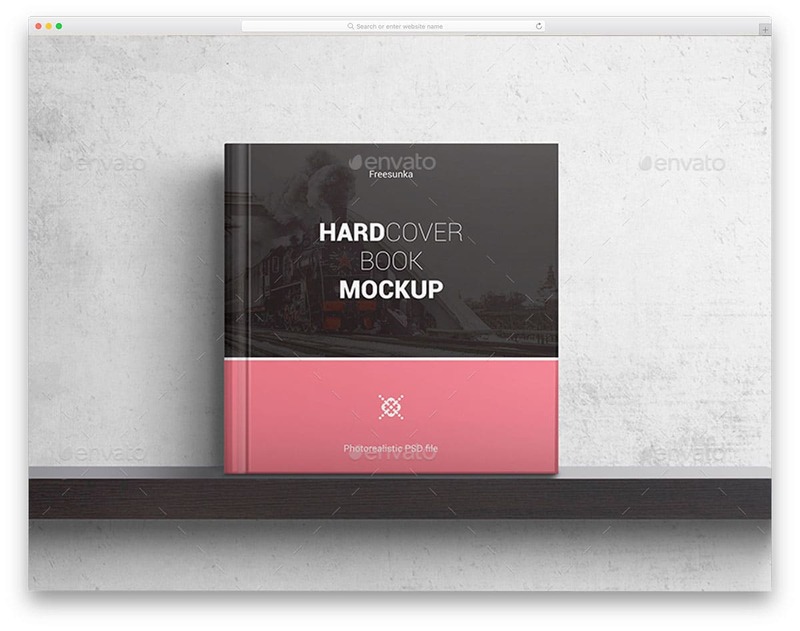 With this mockup, you can show your book cover image, inner page layout, and its designs. 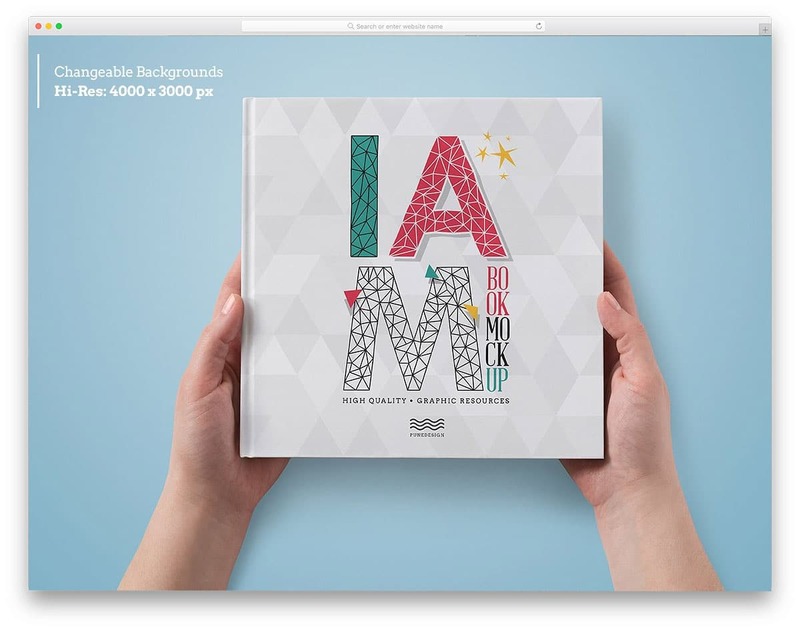 The pages in this book mockup are high-quality reflective papers just like in the magazines. PSD layers are used properly to retain the reflective nature of the book pages. In the download file, you get 12 PSD files. The shadings and the shadows are completely customizable to the way you want as per your design requirements. Cover Book Mockup is the perfect option to showcase your book cover design alone. This mockup includes only the front and the spinal side of the book. Which makes this mockup usability very limited. You can use this mockup to showcase your design or to create images for your website. 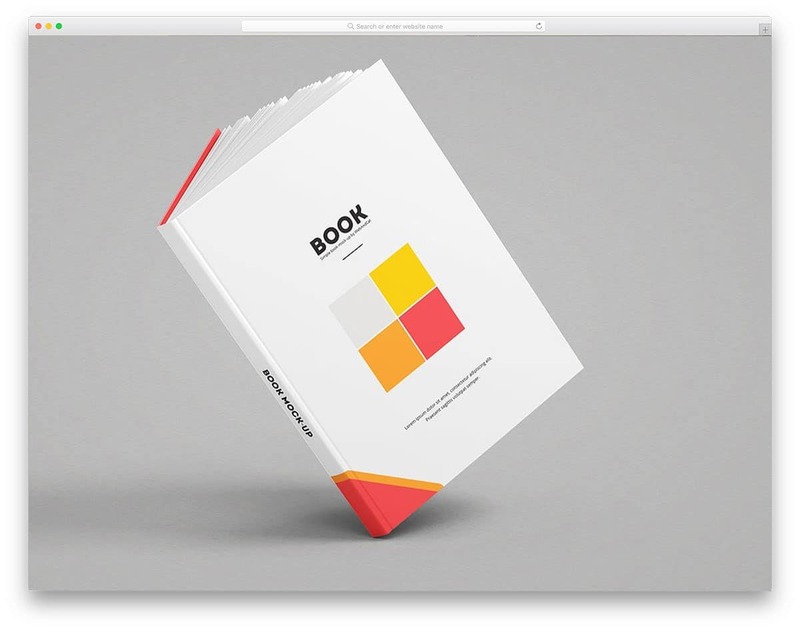 The creator of this mockup has used a regular sized book so that you can use this mockup for all types of book. Shadows give a realistic look to the image, but you can’t adjust the shadows in this mockup. If you are looking for a simple mockup to just show your designs, this mockup does its job perfectly.